MSV: Nazi truck Moves Forward in Hoboken again! 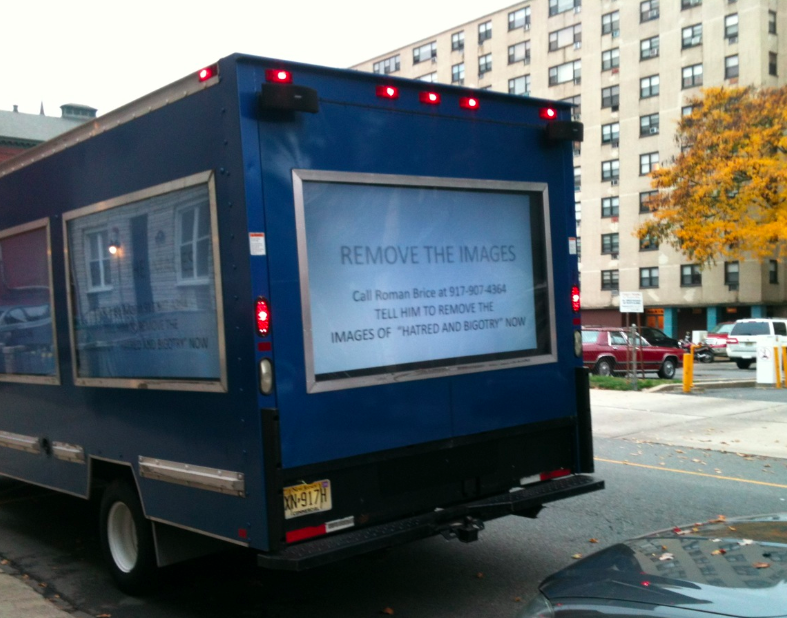 Nazi truck Moves Forward in Hoboken again! If you thought three times was the charm for the infamous Nazi truck in Hoboken, you'd be wrong. Hand over the organic carrots! Wednesday night, the tip line was ringing off the hook here at the Stable. Not because of Beth Mason's de rigueur cybersewer at Hoboken411 earning countess' bidding to defame any and all in her way but with Hobokenites sending in sightings of the unholy Nazi mobile's whereabouts. Over several hours in the evening, reports came in on the rumbling in the Mile Square of the MF Mason Nazi Truck. MF stands for Move Forward, officially of course. You already know what Beth Mason stands for. The MF Nazi truck made a pit stop by Church Towers seeking an erstwhile friendly crowd for its message of stupidity, propaganda and apology. Hoboken411 posted the video with MSV's phone number. The results? Zero takers. Another Beth Mason fail! Hoboken411 put up its typical pack of lies running the video in the hope to show sponsor Beth Mason it has any reach. Since Perry Klaussen the ubermensch Beth Mason boot licker ran the story, it's generated exactly ZERO phone calls. Congratulations to Hoboken411 affirming it's more irrelevant than ever. This should be music to the Hudson Reporter's ears. You guys owe Da Horsey a commission. No way Mason can end the page three ad buys ad infinitum. Back up the Brinks truck! Speaking of the Hudson Reporter, have you seen a column pixel spilled on its internets detailing Beth Mason's four figure illegal expenditures for Move Forward? Maybe they'll figure out a way to paint it in their typically odd moral equivalence this weekend. Hey, any of your reform council members late in paying a parking ticket? Expect to make page one. Is the Hudson Reporter waiting to clarify the five figures Mason is illegally ploughing into the campaign and planning a blockbuster expose on how that total contrasts with a Vote-By-Mail purchase in the three-hundred plus range? Talking Ed Note: MSV did not attend the BoE debate last night but is looking to obtain video and will publish when possible. How come the fourth visit from the Nazi truck is only on MSV? Well the other local media don't think it's helping Move Forward so they aren't going to report on it. What other conclusion can there be?